What if, in 1935, Pres. Franklin Delano Roosevelt and Louisiana's Gov. Huey Long had had a face-to-face meeting? Would it have changed the course of history? Er...maybe not...if they met at a Cajun shack on the Bayou. 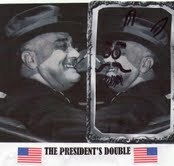 And FDR (or at least his double) was in his cups and running off at the mouth. And FDR's wife Eleanor came to harangue him about his mistress. B,S Productions presents the world premiere of a new light comedy, The President's Double, written by local playwright Tom Hickman and directed by Steve Bailey. If further information or directions are needed, call director Steve Bailey at (904) 246-0312. To the Play's Performers: Our next rehearsal will be at the Pablo Creek Branch Library this Mon., May 17, from 7:00 to 8:45 p.m. This will be the final rehearsal before "dress," and we must be "off-book" at this rehearsal. If any problems or questions, call Steve ASAP at 246-0312 (home) or 314-5801 (cell). Terry Dean McCraney as B.J. This site was last updated on Thurs., May 13, 2010.